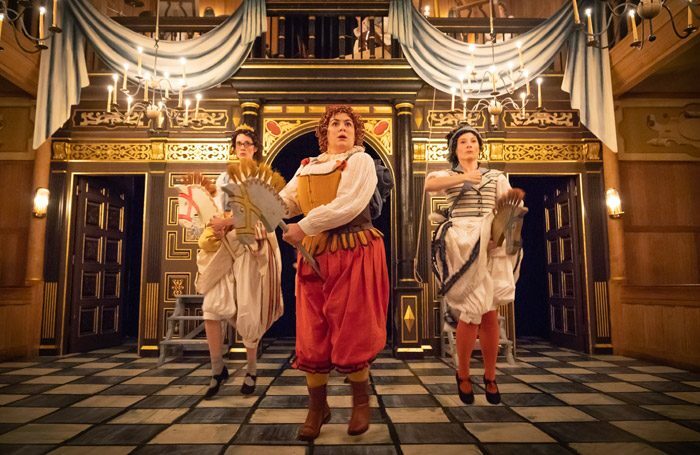 The light comedy meets fairytale of Love’s Labour’s Lost seems like the perfect match for the candlelit auditorium of tte Sam Wanamaker Playhouse, the most romantic theatre in London. Designer Katie Sykes has created a twinkling fantasy world where hobby horses are noble steeds and full skirts swirl to elegant chamber music led by Laura Moody. It’s therefore disappointing that Nick Bagnall’s slapstick interpretation of the play is more likely to generate giggles than passion. The King of Navarre (Paul Stocker) has banned love from his court. 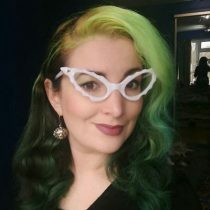 His decree proves short-sighted with the beautiful Princess of France (Kirsty Woodward) and her ladies turning up less than five minutes after his proclaim. Yet despite being a work centred on the virtue and vice of desire, the production is more of a farcical tea party than a lustful banquet. Love’s Labour’s Lost is a maximalist play. It contains Shakespeare’s longest scene (Act V, scene II takes up most of the second half), monologue and word (“Honorificabilitudinitatibus”, thrown in during the Latin equivalent of a rap battle). Shakespeare’s favourite tropes are multiplied with four couples finding their way to each other through witty courting and numerous disguises. Bagnall reduces the lovers down a more manageable three with the King flanked in his wooing by his lords Berowne (Dharmesh Patel) and Dumaine (Tom Kanji). This, alongside the doubling up, should create a tight company of eight but there is a lack of synergy between the actors. Most get their moment in the spotlight, Kanji’s avowal of amour – a Mr Darcy level shirt-ripper – and Rosaline (Jade Williams) unleashing surprising blood lust during the hunt. However, for a farce, the caricatures are strangely insipid. Lady Katherine (Leaphia Darko) and the very funny Charlotte Mills as attendant Boyet are particularly underserved. Bagnall navigates the 16th century wordplay and double entendres by ramping up the physical comedy and audience interaction. Jos Vantyler throws himself across the stage as the moustachioed dandy Don Armardo conversing with himself in a squeaky voice as impish page Moth. With a swagger worthy of Jack Sparrow, he makes heavy work of the comedy in an equally weighty Spanish accent. Vantyler’s exaggeration proves very watchable, set against the largely interchangeable lovers. The action is curiously chaste despite the bawdy jokes. It is a Shakespearian plot device that the lords cannot tell their ladies apart when they switch favours giggling behind by their fans. That the audience can barely tell the difference (or care) either, speaks more to our indifference as to whether “Jack hath Jill” by the play’s close.